When most people think of the word “disability” they immediately picture someone in a wheelchair. But there are many different types of disability. More…. Located in Ilford Lane, Ilford, and in operation now for just over 41 years, Redbridge Disability Association (ReDA) is a voluntary charity Organization providing a range of advice / guidance to enable and support independent living within the London Borough of Redbridge by the disabled community. ReDA aim and want to provide a high class quality, friendly and accessible service to all those who use any of our services, including the Shop mobility service in the Exchange Shopping Mall, Ilford. It’s not easy says volunteer, Kevin Madden, “Funding is extremely tight, we want to help people who are often in desperate circumstances and we always need additional funds.” Despite the challenges, the last year saw hundreds of clients across Redbridge assisted with disability rights issues and benefit advice as well as independent shopping in Ilford through the shop mobility service. A key focus is providing training to business’ on disability and its consequences in the work place. ReDA can provide tailor made programmes to suit every work environment and business. We have been trying to get the Director, Clive Durdle, to come and speak at one of our Coffee Mornings but he has so far proved to be rather elusive – Maybe after Christmas? That graphic is very informative and should be displayed on the wall of every policy maker in London. On public transport great efforts have been made to accommodate wheelchairs, but this often involves removing seats. 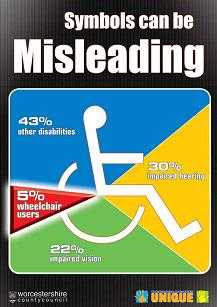 According to the graphic, measures like this benefit just 5% of disabled people but put 65% - those with mobility or sight problems - at a disadvantage because they need a seat. Helping wheelchair users is important but it is not the only consideration where disbility is involved. Well, I'm lucky. I'm now at an age where young women on crowded trains offer me a seat. That's nothing to do with age, Morris!